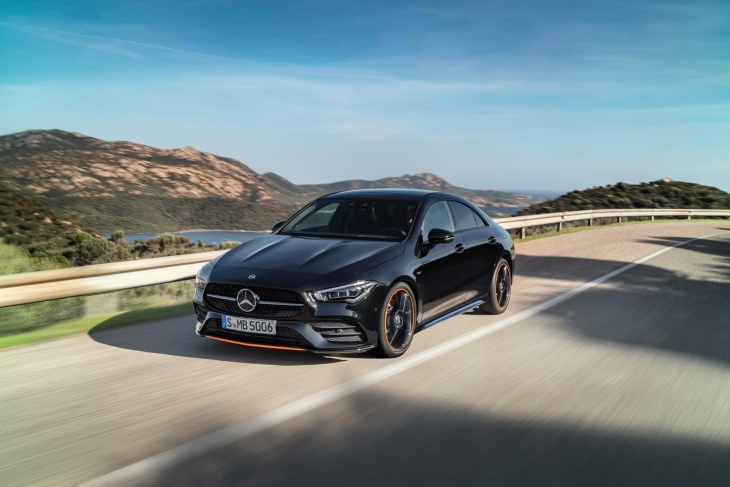 Mercedes-Benz have unveiled the all new 2019 CLA coupe model. The new designs sport a sleek and trendy exterior, in line with other brand new Mercedes models like the CLS. The 4-door CLA has been one of Mercedes’ best selling cars, due to it’s practicality, looks and most importantly it’s affordability. The CLA will go on sale at the end of February and start from just ($36,000) £28,000. The exterior and interior styling are similar to both the A-Class and CLS, with the newer front head-lights and rear stretched tail-lights. The interior boasts the new infotainment system along with the digital dashboard and large screen. This particular model, on the AMG-line, is available with the two-tone orange trim, also known as the Orange Art Edition. The orange trim follows the CLA on both exterior panels, as well as along the lines of the interior seats and dashboard. Here are some official shots of the all-new 2019 Mercedes CLA, which will go on sale towards the end of February.